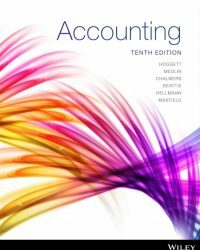 The tenth edition of Accounting 10th Edition is a must-have resource for students who want to succeed and develop a rich foundation of knowledge in the area of Accounting. Designed for students of all levels the new edition will provide you with an introductory but comprehensive description of the purpose, practice and process of contemporary international financial and management accounting in an Australian context. With the increased emphasis on the globalisation of business the content covered throughout this resource is ideal for the study of introductory accounting in a broad international context. Written by an author team of experienced academics and researchers, led by John Hoggett, each chapter is engaging and highlights key concepts. The new edition features unique videos from high-profile practitioners to provide you with insights into the real-world application of accounting. Delivered as a full colour printed textbook with an interactive eBook code included, this title enables you to master concepts and succeed in assessment by taking the roadblocks out of self-study, with features such as videos, case studies, interactives and revision materials embedded at throughout the textbook that are designed to get the most out of learning. Hear from Practitioners: Exclusive videos from high-profile practitioners at PwC provide insights into the real-world application of accounting. Embedded Rich Media: Demo problems, interactive questions and other rich media are embedded throughout the text. Revision Modules: Revision materials are integrated throughout to help students engage with, understand and retain course concepts. Decision-Making Focus: Hoggett’s 10th edition builds upon previous editions technical skills with a strong focus on decision-making. Dr John Medlin, PhD (UniSA), BEc (Adelaide), MEc (UNE), FCA, is an Associate Professor in the School of Commerce at the University of South Australia. John began his career with Ernst & Whinney (now Ernst & Young) in the early 1980s. After a few years of practical experience, John moved to accounting education where he has lectured in both financial accounting, accounting theory, management accounting, economics and business finance. From 1998 until 2010, John coordinated a general first-year accounting subject with an enrolment in excess of 1000 students each year, 80% of whom were non-accounting majors. Since 2010, John has coordinated a second-year financial accounting subject. He has been recognised with teaching awards from the University of South Australia. His research interest is in the area of accounting education, where he has presented conference papers and been published. Claire Beattie, BCom (1st Class Honours), PhD, is a lecturer in the School of Commerce at the University of Southern Queensland. Before becoming an accounting academic, Claire worked in New Zealand as a management accountant in the manufacturing sector. Claire has taught both financial and management accounting courses at universities in Australia and New Zealand, including the University of Melbourne, University of Canterbury and Massey University. Over the past twelve years, Claire has coordinated the undergraduate and postgraduate management accounting courses at the University of Southern Queensland. Claire’s research interests include the practice of performance measurement, the role and impact of management accounting in non-traditional environments and accounting education.